Jacko.MY: New Discovery @ USJ 14! It's by the roadside in USJ, Subang. 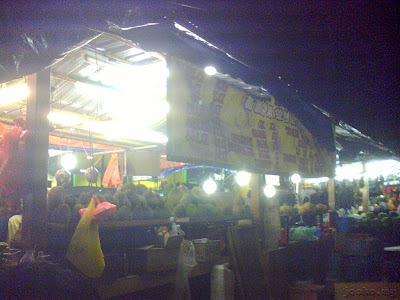 There are total of 4 stalls, 3 selling durians. I tried 2 stalls, first and second. First stall, I would say it's a "corporatized" stall. You can see the staff are wearing same yellow T-shirt. 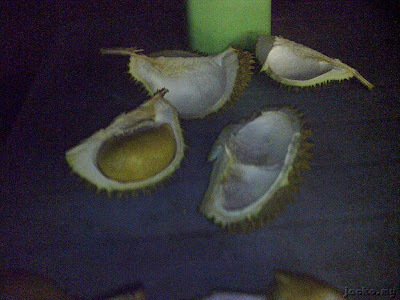 The stall sells "branded" durians, as well as kampung durians. 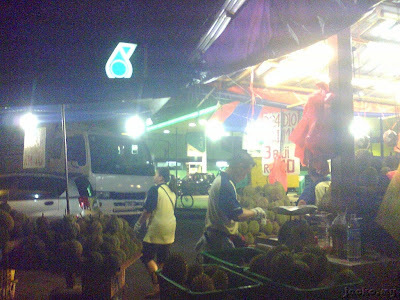 Staff in charge in "branded" durians department have no say on kampung durians department. I tried branded one over there then wanted to take away some kampung durians priced at RM10 for 3, the "branded" staff had to "handover" me to the kampung staff. Hehe... though, I paid only a single bill. "Brand" wise, D24, Mao San Wang, Red Prawn, D2, AA24 and all sort of numbering, you name it. Taste wise, varieties of choices depending on your tongue preference, from sweet to bitter, from dry creamy to watery. 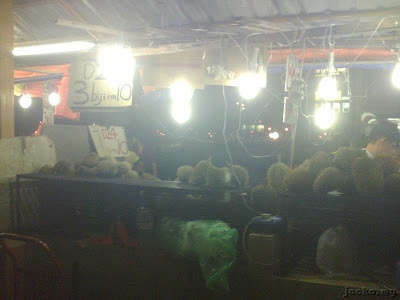 Price wise, reasonable like RM10 for a kg for "branded" durian and RM10 for 4, 3 and 2 for kampung durians. I guess bargainable but I didn't 'cause I think I would only be a 1-time customer due to location. Service wise, thumbs up, very customer focus and free mineral water! Second stall, I would say it's a family business. From son and daughter in law (or son in law and daughter) to the parents in law, everyone is working on their duties. Thumbs up for the service too!! I was approached by the female boss immediately when walk passed the stall, not "intrusive" but very polite greeting. Even asked for feedback when paid, whether the durians were ok! 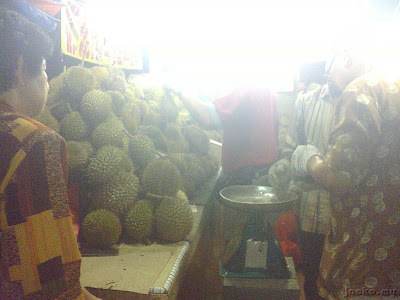 Need not say again, the durians are of the same like the first stall, but since it's family business, the stock is lesser than the first. Price wise, slightly cheaper than first stall, RM7 to 8 per kg depending on the "brand". Similarly, RM10 for 4, 3 and 2 for kampung durians. Third stall, didn't bother to try. Bad service. Full stop. Although I ended up paid and ate more at the first stall, I would say give a try to the second stall since it's family business. I feel it's warmth and harmony to see a family of different generations working together for a business, sick of watching those Hong Kong series that A bites B, B kills C even in the same family. What a messy family. 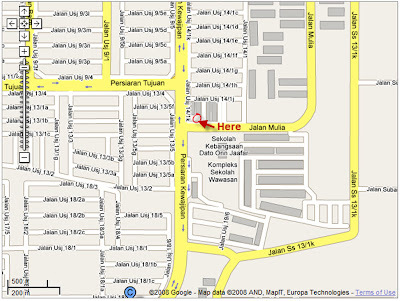 If you know USJ, it's along Persiaran Kewajipan, on the direction to Puchong and Elite Highway, located at USJ 14/1K, beside the Petronas station. Just turn left into the junction after you see the Petronas on your left and turn left immediately into the street (USJ 14/1K). Quite congesting there but you can find parking easily.